Eltronicschool. - This is one circuit schematic for you who want to build battery monitor in this time. 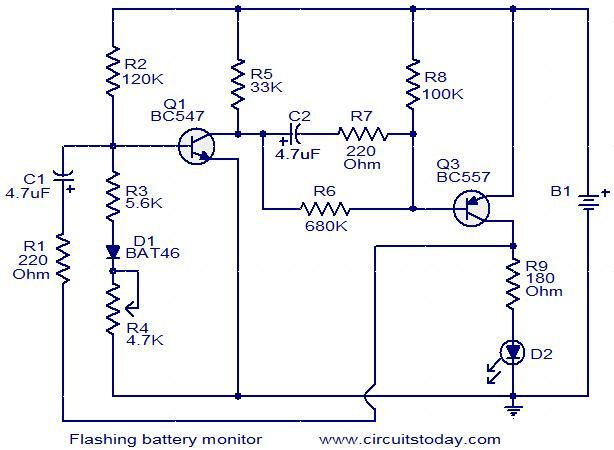 Now, you can use the circuit schematic of Flashing Battery Monitor using Transistors below. In this time, eside we will show you circuit schematic, we also will give you the description of this circuit and the last we will give you the link to read more about this circuit schematic from original source. Circuit schematic like in Figure 1 above is Flashing Battery Monitor using Transistors. Circuitstoday site describe that here is a simple circuit in which an LED will continue flashing as long as the voltage of the battery to be monitored is above the set level.The transistors Q1 and Q2 are wired as a complementary astable multivibrator.The circuit can operate from a voltage range from 6V to 12V. The voltage level at which LED has to stop flashing can be set by adjusting the preset R4.When the battery voltage reaches the threshold the flashing frequency decreases and when the voltage goes below the threshold the LED becomes OFF.The diode D1 is used to compensate the changes in the base emitter voltage of Q1 due to temperature changes. And now you can read more about the Flashing Battery Monitor using Transistors circuit schematic from original source using link HERE.